Recently I've been making these binary robot cards. And I thought this was a good time to review how I often go from doodle into a "final" form. 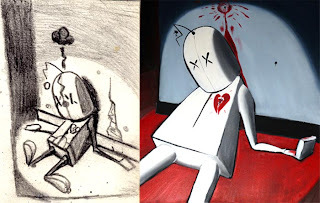 To begin though, I should note that the cards original inspiration comes from a doodle over 3 years in age, that resulted in a painting I currently have hanging in my living room. One night while looking at the above painting, hanging rather uncomfortably over the edge of my couch I doodled onto my floor what would eventually become a limited series of silkscreen wooden and paper cards. Below is the first iteration from floor drawing to hand drawn wooden cards. The last of this series I managed to ship and sell on Etsy, while the first, the heart one, I gave as a "tester" gift to my sweetums. The second derivative of the floor drawing was a more refined limited silkscreen run on smooth found wood silkscreen prints and a companion limited paper card series. From the hand drawn series I expanded on the use of binary as a geeky but unique and appropriate method to say "Thank U"
All of these, of course, are now on my Etsy site, *hint*hint*wink*wink*. I hope, in sharing these stories, it'll make you think twice about what can come from those meandering lines you may be scrawling about.